This project was a pilot initiative of the US Fund for UNICEF from 2010-2011 to develop an after school civic engagement program that focuses on: 1) educating children and youth about their rights, and 2) building their capacity to become leaders and activists for children’s rights in their communities in the United States. The program is based on the Child Friendly Communities Assessment Toolkit. 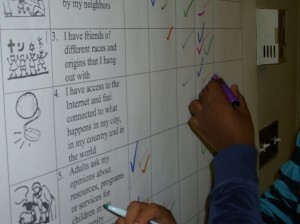 The Children’s Environments Research Group partnered with the Isaacs Center (an East Harlem community based organization), and Corner the Market Media (a non-profit youth media education group) to collaboratively develop the program with a total of 20 youth between 13 to 18 years of age. Youth participants worked on three primary activities: 1) a child friendly community assessment of East Harlem (view the results), 2) a program blog about children’s rights in East Harlem (view the blog), and 3) a film and speaking tour to raise awareness on children’s rights (view the film). The program integrated digital media and online conference calls with youth in Brazil to learn about children’s rights and to exchange lessons from using the Child Friendly Communities Assessment Toolkit. Youth continue to be involved in the initiative, and more information can be obtained from the project’s blog – Future Building a Future in East Harlem. A child and friendly community is one in which local public authorities work in partnership with children, parents, schools, community based organizations and social service providers to fulfill children’s rights. Children’s rights are outlined in the Convention on the Rights of the Child (CRC), an international treaty ratified into national law in the 1990s by every country in the world except the United States and Somalia. The CRC applies to every child aged 18 and under, and guarantees minimum standards for children’s well-being and development, protection and participation in matters that concern them. Building child friendly communities is a long-term process; it is both a vision and model of community development that places children at the center. Child friendly communities are places that value young people as resources, participants in decision-making processes, and capable citizens, rather than passive beneficiaries or recipients of services. Child friendly communities leverage and coordinate existing assets of a community for children across local government agencies and community groups to create equitable, inclusive and just places for children to grow and develop. The Child Friendly Communities East Harlem pilot project engaged a wide range of children, youth and community members and organizations in East Harlem, the New York City region and other countries around the world. In total, nearly 400 individuals from East Harlem and the New York City area, and over 3,000 individuals from all over the United States and world participated in the program in some way. This included approximately 200 children and youth between the ages of 8 and 18 (3rd through 12th grade). For more information, visit the project blog at Future Building a Future in East Harlem.